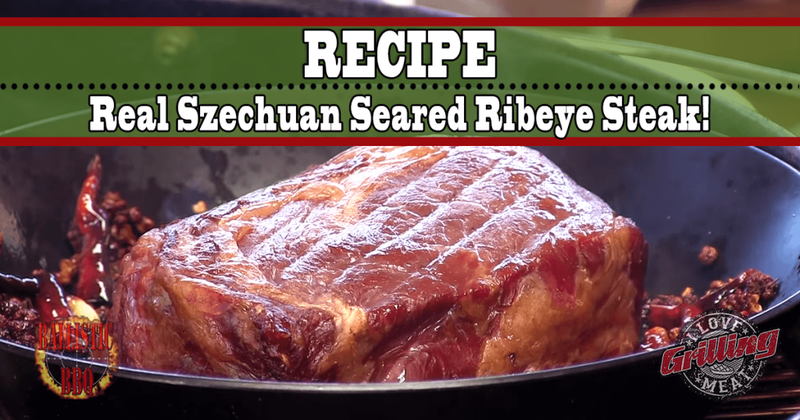 If you’ve been wondering what all the fuss is about over this cook, relax and get ready to cook yourself a real Szechuan seared ribeye steak! This mouthwatering beefy meat is cooked low and slow, then seared with all the right flavors that’ll make their mouths water for more. First, start by giving the ribeye a nice coat of straight Kosher salt. Leave it on the side, while you set up your cooker for low & slow cooking at 200ºF-2225ºF. Next, place the steak on your cooker and monitor core temperature using a meat probe. When core temp hits 80ºF, flip the steak, then let it go all the way up to 120ºF. When you reach roughly 10º before your steak’s desired doneness (so for medium rare, when it’s at 110ºF), light a new charcoal chimney. This charcoal will be used for searing the steak. When the steak hits 120ºF internal, take it of the cooker and lightly tent it with some foil. Allow carryover temperature to keep cooking it while setting up a cast iron skillet for searing on the grill. Then, preheat some sesame oil and place the two halves of the garlic clove in the oil – this will give the oil more flavor. Make sure to remove the garlic before it burns! Then throw the Szechuan peppers and chili peppers in the skillet. Once they are nice and toasty, make some room and place the steak on the skillet as well. Give each side a good sear, then sear the outer edge as well. Then pull it from the heat and let the szechuan seared ribeye rest for ~10 minutes. Bacon Wrapped, Crunchy BBQ Corn On The Cob! We are a blog for grilling, smoking, BBQ enthusiasts with a passion for rubbing their meat, pulling their pork, and having a great time doing it. If you share the same love for your meat, then we share the same love for you, welcome to I Love Grilling Meat my friend! At I Love Grilling Meat our mission is to be the best blog providing knowledge, techniques, and skills in the grilling, smoking, and barbecuing meat fields to any and all who wish to become better pitmasters and providers of those sweet n' savory meats we've all grown to love so dearly. Our goal is to be the ultimate one stop destination for anyone that has an interest in or questions regarding grilling, smoking meat, and barbecuing. We strive to maintain a truthful and unbiased library of knowledge, both in original content, product reviews, and barbecuing tips, as well as curated articles from other top grilling, smoking, and barbecuing websites. We want you to show us your meat!